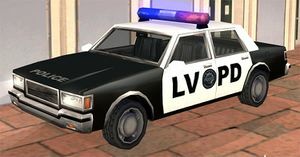 An LVPD police car, GTA San Andreas. Police cars are emergency services vehicles primarily used by police officers. The cars begin to chase the protagonist of each Grand Theft Auto game when they have received either a police head or wanted star. Police cars are known by different names in different games, whilst GTA IV has two models of police cars: The Police Cruiser and Police Patrol. Since GTA III, the majority of police cars in the game also share the same body design as the Taxi. Other police and law enforcement vehicles exist. These include the Enforcer police/SWAT van, the Police Maverick helicopter, HPV-1000 and VCPD Wintergreen police bikes and the Predator police boat. In Grand Theft Auto 1, the police car is known as the "Squad Car". Three variants of the car exist, each appearing in one of the game's three cities. In Liberty City, the Squad Car is rounded vehicle with blue-white livery, appearing similar to a 1990s Chevrolet Caprice, with a 1990s NYPD livery; the San Andreas/Vice City variants are actually adaptations of the Portsmouth, with the San Andreas version bearing a black-and-white body color design (like its real-life San Francisco counterpart) and similar angular body design , and the Vice City rendition being colored blue and white but features a modified body that appears wider and rounded. In the PC version of GTA 1, the police cars (along with the Ambulance and the Fire Truck) will have their radio tuned to Brooklyn Underground FM, unlike all other renditions throughout the series which only have the standard police dispatch radio. The performance of GTA 1 Squad Cars are identical in all three cities, and are all essentially the best in the game, with the highest top speed and acceleration among all cars in the game, highly responsive brakes and good grip. While the cars are given a very high export value of $2,000, but the cars cannot be exported, as are other emergency vehicles. Police cars in GTA London 1969 and GTA London 1961 are known as "Coppers". Liberty City "Squad Car" (GTA 1). San Andreas "Squad Car" (GTA 1). Vice City "Squad Car" (GTA 1). A Copper in GTA London 1969. A Copper in GTA London 1961. In Grand Theft Auto 2, the police car is known as the "Cop Car" and assumes a completely original design, looking like a retro-futuristic squad car with 1940s design cues. Like in GTA 1, it is the fastest car in the game, along with the Meteor, and features responsive cornering and brakes, making it a desirable vehicle to drive. It is also the only car in the game which gives a Cop Bribe when crushed. Ray Larabie's original design for GTA 2's "Cop Car". 3D rendering of the "Cop Car". Anywhere City "Cop Car" (GTA 2) (In-game, with lights). In all the games of this era, the police car has been known as the "Police", with the exception of GTA Advance and GTA Vice City Stories. In GTA Advance, it is referred to as the "Police Car", and in GTA Vice City Stories, it is called the "VCPD Cruiser". Throughout all GTA III era games, police cars are very fast, with excellent handling, and moderate durability. These stats make it great for drifting. They have two sirens, one default "long-whirl", and the "rotating-weep", triggered by holding the horn button. The player will receive a Shotgun with 5 rounds of ammunition after entering a Police car. The Police Car in these two games resembles a cross between a Chevrolet Caprice and a Ford Crown Victoria. In GTA III, the Police Car was originally intended to have a livery similar to the then-current NYPD police cars, however, in the final version, they have standard black and white livery. The Police Cars in GTA Liberty City Stories feature the livery intended for GTA III cars, albeit with black-and-white stripes, rather than blue-and-white. Early pre-release depiction of GTA III's police car, featuring a lower profile and the 1990s/early 2000s NYPD color scheme. LCPD "Police" car (GTA III) (Rear quarter view). LCPD "Police" (GTA Liberty City Stories) (Rear quarter view). In these two games, the vehicle resembles a 1980's Ford LTD, and both feature a green and white livery, much like the Miami-Dade Police Department (although there rare claims that white police cars can be found after achieving 100% completion of Grand Theft Auto: Vice City). During development, the vehicle was white with red and blue stripes along each side, resembling squad cars from the Miami Beach Police Department. Reports say that the paint scheme was changed in development to the green and white scheme because of fears that players would not be able to tell the difference between civilian cars and the VCPD cars. In the PC version of GTA Vice City, a gaming bug causes rare all-white police cars to spawn at car parks around Vice City. The glitch only appears to occur when using certain third-party 100% completion savegames. Early pre-release depiction of GTA Vice City's police car, featuring a livery more alike to that of the Miami Beach Police Department. VCPD "Police" (GTA Vice City) (Rear quarter view). A white Police in GTA Vice City, obtained through a game bug. "VCPD Cruiser" (GTA Vice City Stories) (Rear quarter view). There are three variations in GTA San Andreas. The Los Santos Police Department and San Fierro Police Department versions have the same build (with the San Fierro version having slightly higher suspension, most likely due to San Fierro's hilly streets with steep inclines like it's real life counter-part, San Francisco), based on the Premier, and markings for their respective cities); the Las Venturas Police Department version generally resembles a 1981-1990 Chevrolet Caprice, with the sides and back reminiscent of the 1980-1989 Dodge Diplomat. The closest civilian car in the game is the Tahoma. All police vehicles feature a standard black and white livery. The police officers in the countryside employ a large, four-by-four Ranger, based on the Rancher, for pursuit on rough terrain. Early design for the SFPD "Police" car which bears more of a resemblance to the Chevrolet Caprice than its final design. An early and unnamed FBI car, later adapted into the LVPD "Police" car. LSPD "Police" (Rear quarter view). SFPD "Police" (Rear quarter view). LVPD "Police" (Rear quarter view). The GTA Advance rendition of the Police is designed to bear a likeness to the Police from GTA III, with a generally rounded profile and a black-white paintjob. Unlike other renditions, the car is substantially more speedy, with a top speed matched with the Banshee's. Being a mid-sized car, crushing the Police will only award the player with a base amount of $532. LCPD "Police car" in GTA Advance. LCPD beta "Police car" seen in an early screenshot sporting a blocky design. In Grand Theft Auto IV, there are two similar but separate police cars - the Police Patrol and Police Cruiser. Two more police cars, a Buffalo-based Police Cruiser and a high-performance Police Stinger, are available in The Ballad of Gay Tony's multiplayer. The player can get in any police car and access the police computer while stationary. Here, the player can access Most Wanted missions, or locate and apprehend nearby criminals. The siren on the Police Car features some variations, including the classic "code-3 siren" wail, the yelp when the siren is activated and the horn button held down, and, if the siren is turned off and the horn button held down, a distorted "crowd control" air horn, as used in real life. The player can dial 911 to summon the police car by luring them to a false alarm. Stealing the car (while the officer searches for any incidents), will attract a one-star Wanted level. In some places, a police car can be stolen from a parking lot or curbside without incurring a Wanted level. LCPD Police Cruiser (GTA IV) (Rear quarter view). LCPD Police Patrol (GTA IV) (Rear quarter view). LCPD Buffalo-based "Police Cruiser" (TBOGT). An LCPD "Police Patrol" (GTA Chinatown Wars). Police cars in GTA Chinatown Wars are simply dubbed "Police Patrols", the same name for those seen in GTA IV. While having reverted to a panda body color scheme, the car incorporates GTA IV's police computer for use in vigilante side missions. Although the car is implied to be similar to GTA IV's Declasse-based Police Patrol, pre-rendered depictions of the Police Patrol and the Police Cruiser are used for "busted" sequences in the game. Grand Theft Auto V is slated to feature at least two variants of police cars, one used by the Los Santos Police Department and the other a "Sheriff" variant likely to be featured in rural segments of San Andreas. The LSPD car has assumed several designs over the course of GTA V's development. Originally depicted in the debut trailer for the game to be based on GTA IV's Police Cruiser (with a reskin and a simple light bar), the car was portrayed in later pre-release screenshots being redesigned with a new Vapid-branded body of a similar size, which is also adopted for GTA V's taxis. Both these versions of the car feature "Obey and Survive" mottos, in addition to a logo bearing a picture of Bigfoot in the bottom right corner of the Shield, possibly a reference to the Grand Theft Auto: San Andreas myth. A third design for LSPD's police car based on the 2009–present Ford Taurus Police Interceptor Sedan was unveiled in the April 30, 2013 character trailer. It is currently unknown if this variant complements the second LSPD police car design. An LSPD Police Cruiser in the first GTA V trailer. Closeup of an LSPD Police Cruiser's logo in the first GTA V trailer. New Vapid LSPD police car. The design of GTA Vice City and GTA Vice City Stories' police cars serves as the basis of those featured in the Manhunt series. In GTA IV, if the siren takes a hit it will begin to make many different high-pitched noises similar to its normal siren, but severely distorted. Other cars also won't pull over if you are driving a police car with a distorted siren. In the beginning of the game of GTA San Andreas, an LSPD Police shows up. But the rims are different, similar to that of the Police and Taxi in GTA Vice City. Police cars are usually parked in front of police stations and are often locked. Police Cruiser and Police Patrol, GTA IV equivalents. Police Stinger and the Buffalo-based Police Cruiser, The Ballad of Gay Tony equivalents. This page was last modified on 12 August 2016, at 08:48.